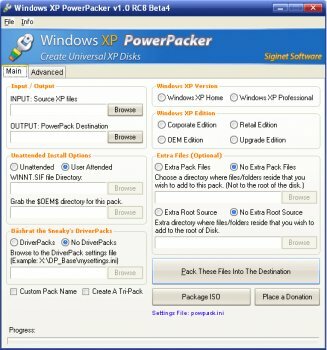 PowerPacker will help a user create a Multiboot Windows XP disk with or without DriverPacks. It will do almost everything for you, even hex edit the files needed to be hexed, create the boot directory, boot menu, etc. It makes creating multiboot XP disks a breeze. Although I use nLite for more advanced installs -- I have to say this program is freaking awesome. Truly stupid-proof (speaking for myself), PowerPacker is seriously impressive. Sorry guys RC4 was compiled incorrectly. RC4.1 should be on Betanews.com soon. I have allready submitted it. I want to recap on what I said earlier and make it clear: PowerPacker is a GREAT TIME SAVER and resource for those looking for a solution to create an all-in-one Windows XP setup CD/DVD with very little intervention. (Saving time from doing the work by hand!). Give it a try and you'll be glad you did. Personally... I don't understand the low rating you have given. The program is not buggy anymore. You obviously did not try it. Also it is not supposed to be like NLite. It is a totally different program. If you don't want a program for making multiboot disks... what are you even rating the progam for? Duh! Bobad, this program serves an entirely different purpose than nLite. NLite is for removing superfluous components from a Windows installation CD, this is to simplify making a multiboot CD/DVD. Personally I think this program is unnecessary and rather buggy for its simple function; I recommend making the multiboot changes by hand. A cool and very useful program. I like the simplicity. I have been using nLite, and although it has many more options than PowerPacker, it's tedious and complicated. You must give this one a try! PowerPacker is a great time saver and resource for those looking for a solution to create an all-in-one Windows XP setup CD/DVD with very little intervention. I've been using it now for two weeks before it came to the FileForum and it has helped me so much already. Give it a try and you'll be glad you did.